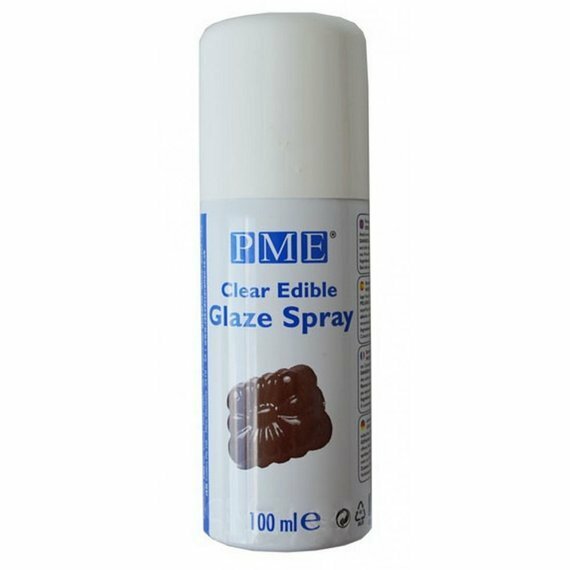 100ml CLEAR GLAZE SPRAY by PME. Good quality clear edible glaze for use on sugar flowers, models, fondant, chocolate, gum paste, royal icing, marzipan and other edible treats. Will also lock those sparkle dusts in place, and prevent airbrush colour from smearing. Can of spray can also be used for pastry and other foods. Use this glaze spray to bring shine and seal your Sugar Art projects. Great for fast, easy application and even coverage over larger areas.